Chapter Bylaws may not conflict with the Constitution of Upsilon Sigma. The name of this chapter shall be the Upsilon Sigma Chapter of [Insert University Name]. Note: Should two or more units wish to establish an Upsilon Sigma chapter at a university, we strongly encourage the units to collaborate and establish a shared chapter. Section 1. Purpose. 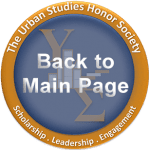 Upsilon Sigma was created by the Urban Affairs Association (UAA)to recognize the academic achievements of undergraduate and graduate students pursuing degrees in urban studies and related fields. Urban Studies is a broad umbrella term for academic programs and research that focus on the social, political, economic, spatial, physical, historical, cultural, and environmental dynamics of urban contexts. Elements of urban studies can be found in several different disciplines as well as within explicitly interdisciplinary fields such as urban affairs and urban planning. Given the varied academic homes for urban studies, eligibility for participation in the Society will be judged on the basis of individual program attributes. See Appendix A for a sample of urban-related topics that are examined by a broad range of academic disciplines. Note: Any additional professional objectives/purposes that are unique to the chapter and relate to the national mission may be inserted immediately above. A. The Governing Board of the Urban Affairs Association (UAA). The Governing Board consists of fifteen (15) members. The members of the Board are nominated and elected by the members of the UAA. The Governing Board shall establish, review, and modify (as needed) all policies related to the Society. B. Chapter Advisory Council (OPTIONAL). The Chapter Advisory Council shall have at least three faculty members or administrative staff from [Insert University Name]. At least one of whom shall be a member of the faculty. The Faculty Advisor shall be a non-voting ex officio member of the Advisory Council. The Advisory Council shall assist the Chapter in fulfilling its mission and purposes and shall perform such other duties as are specified in these Bylaws and the Constitution and rulings of Upsilon Sigma. A. Membership is limited to undergraduate and graduate students who demonstrate academic achievement in a degree in Urban Studies or a related field of study. All membership is national membership with local chapter affiliation. Completed at least 50% of the required coursework for their degree. Note: Membership requirements must meet the minimum criteria as established by the UAA Governing Board. Any chapter, at its discretion, may establish higher criteria. Section 2: Maintaining Membership. Members whose financial obligations to the Chapter and to Upsilon Sigma are paid and current are active members, with all privileges of active membership, including the right to vote and to hold office. Section 1. Elected Officers. There must be at least three elected officers. The officers may have titles such as President, Vice President, Secretary, and Treasurer. Section 2. Nominating Officers. The Chapter should establish a procedure for nominating officers. All members should be informed of the procedure and given an opportunity to make nominations. Officers shall be elected by ballot to serve for one year or until their successors are elected. No member shall hold more than one office at a time, and no member shall be eligible to serve more than two terms in the same office. Note: Term of office may vary. However, it is recommended that no member serve more that two years in the same office. Section 3. Executive Committee. The elected officers shall constitute the Executive Committee. The Committee may meet and make decisions on behalf of the membership. Note: Responsiblities of the Executive Committee that are unique to the individual chapter may be inserted immediately above. Section 5. Removal of Officers. Any elected officer of the Chapter may be removed for just cause. Sufficient cause for such removal may be violation of the Chapter Bylaws or Society Constitution or any lawful rule, practice, or procedure adopted by the Chapter or other conduct deemed to be prejudicial to the best interest of the Chapter. Section 1. The officers shall perform the duties prescribed by these Bylaws, the Constitution of Upsilon Sigma, and by the parliamentary authority adopted by the Chapter, and shall fulfill such other duties and requirements as may be determined by Upsilon Sigma. Section 2. The President shall have general supervision and direction of the officers of the Chapter, shall preside at all meetings of the Chapter and the Executive Committee, shall appoint (with the approval of the Executive Committee and the Chapter Advisory Council) all chairs and members of standing and special committees unless otherwise stated elsewhere in these Bylaws, and shall be ex-officio member of all committees except for any nominating committee. Section 3. The Vice President shall have the powers to perform the duties of the President during any absence or disability of the President. Section 4. The Secretary shall record the proceedings of all meetings and have such other duties as may be determined by the Faculty Advisor, Executive Committee or the President. Section 5. The Treasurer shall have such duties as may be determined by the Faculty Advisor, Executive Committee or the President. Section 2. Special meetings can be called by the President or the Executive Committee and shall be called upon the written request of [insert number] active members of the Chapter. The purpose of the meeting shall be stated in the call, and business shall be limited to that which is stated in the call. Except in cases of emergency, at least three days’ notice shall be given. Note: Committees may not be needed by all Upsilon Sigma chapters. However, any Standing Committees should be included in this Article. See Appendix B for examples of types of Standing Committees that a Chapter may have. The rules contained in the current edition of Robert’s Rules of Order Newly Revised shall govern the Chapter in all cases to which they are applicable and in which they are not inconsistent with these Bylaws, the Constitution of Upsilon Sigma, and any special rules of order the Chapter may adopt. These Bylaws may be amended at any meeting of the Chapter by a two-thirds vote, provided the amendment has been submitted in writing at the previous regular meeting or has been submitted in writing to all active members of the Chapter at least two weeks prior to the meeting at which it is to be considered. No amendment shall become effective until approved by Upsilon Sigma. These Bylaws shall not be in conflict with the Constitution of Upsilon Sigma. Any amendment of the Constitution of Upsilon Sigma that affects these Bylaws shall cause this document to be amended automatically to concur with such amendment. Reminder: The creation of Standing Committees are OPTIONAL. The Publicity (Public Relations) Committee shall promote Upsilon Sigma within the [name of institution] community, especially within the [name of unit]. The Editor shall serve as chair. The Honors Event Committee shall cooperate with the [name of unit] to arrange events to recognize honor students. The Vice President shall serve as chair. The Initiation Committee shall make arrangements for initiation ceremonies. A member of the Executive Committee shall serve as chair. The Program Committee shall select programs and make arrangements for meetings. The Vice President shall serve as chair. The Finance Committee shall prepare the budget and make an annual analysis of Chapter fiscal management. The Treasurer shall serve as chair. The Bylaws Committee shall submit amendments to the Bylaws to provide for changing Chapter needs and to provide consistency with the Upsilon Sigma Constitution and [name of institution] policies for student organizations. The President shall serve as chair.